Recipes. Reviews. Recommendations. I love to Eat. Burgers are my Kryptonite! There are some recipes that allow you to make two similar but different dishes, like my my spinach and cannelloni post. Here I also made a lasagne using the same ingredients. This is a homemade version of a dish I tried at Reds True BBQ in Nottingham. See the review here. This recipe is essentially my pulled pork burger served another way. The Swine Fries at Reds consisted of a mixture of sweet potato and skin-on fries topped with Red’s pulled pork, grilled cheese, chipotle sour cream, spring onions, sliced jalapeños, and coriander and lime salsa. Instead of rewriting my recipe here I will link the elements of previous posts I used. Sweet potato and skin on potato wedges. Recipe here. 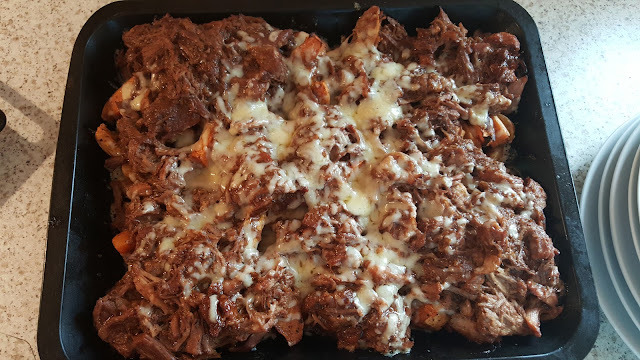 Layer the wedges on a baking tray and sprinkle with cheese. Layer the pulled pork over the wedges and sprinkle more cheese over the pulled pork. Place in the oven at 200C until the cheese melts. 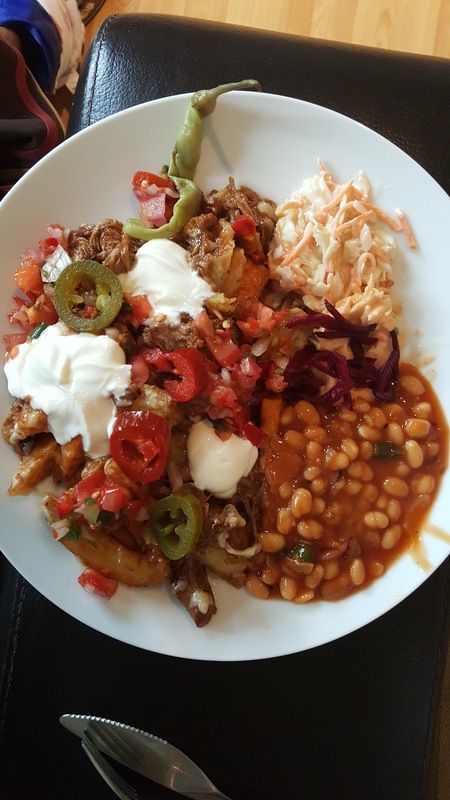 I placed the wedges and pulled pork mix on the plate and topped with the other ingredients and served the slaws and torka beans on the side. Its always fun recreating a good meal you have had at a restaurant at home. I love to Eat, I love to Cook, I like to share my thoughts on food and hope you like what you see. Dad to two amazing boys one aged 4 and the other 11 months, who keep me on my toes and part of a foodie family! Burgers, Pink or cooked through?